Plain-jane drip brewers beware, the Breville Precision Brewer promises an extended featureset more robust than any brewer on the market. The Precision Brewer starts with a dedicated Gold Cup setting that meets all standards for SCAA certification, including a brew temperature between 198 and 204°, a total brew time under 8 minutes, and an even wetting of the coffee bed. 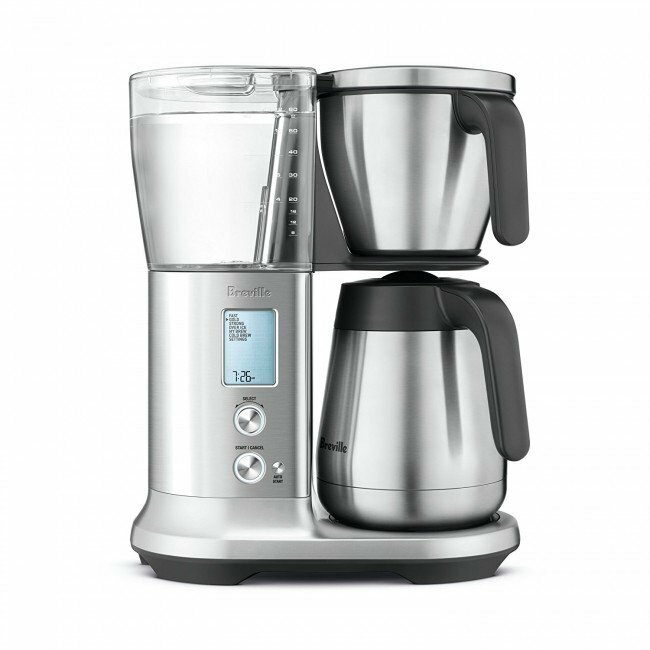 Other dedicated drip brew modes include 'fast' for a quicker brew that raises flow rate, and 'strong' which lowers it. You also get a 'My Brew' setting that gives you direct control over bloom time, flow rate and temperature. Each mode accepts brew sizes between 8 and 60 ounces, and lets you adjust for #4 cone or regular flat bottom filters (or the included goldtone reusable basket filter). This extra-flexible basket design also opens up brew options not usually possible in regular drip brewers, including automatic cold brewing, over-ice brewing, and settings for automatic pour overs with a V60 or Melitta in place of the drip basket. If you're a lover of multiple brew methods, the Precision Brewer's multi-use design is sure to impress. Gold Cup Certified - The Breville Precision Brewer recently passed certification as a Gold Cup Brewer by the SCAA! Fast Brew - Need your coffee a little faster? A dedicated fast brew option speeds up the flow rate for quicker cups. Cold Brew, Ice Brew - Also packed in are brew settings for a 12-hour cold brew steep, or a hot brew with half the water for ice brewing. Single Cup - A dedicated single cup option lets you brew up to a 20 oz. mug of coffee for those on-the-go mornings. Cone or Flat Basket - The Precision Brewer comes with different baskets for different brew sizes, and includes both a flat bottom metal filter basket (paper filters also fit) and a #4 cone basket. Programming - Customizable settings for bloom time, temperature, flow rate, and auto-start programming give you extra options to find your favorite brew. Stainless Carafe - This is the stainless carafe version. Click here for the glass carafe version. Quality Coffee - Calibrated to brew at the SCAA-rated 198-204°, the Precision Brewer makes a seriously good cup of coffee. Versatile - Drip coffee? Check. Single cup? Check. Cold Brew? Yep. Iced Coffee? Good to go. Multi-use brewers are awesome. High-capacity - Being able to brew up to 60 ounces of coffee at a time is fantastic for guests, parties, or just the caffeine-deprived. A Little Tall - Standing at just under 16 inches, the Precision Brewer is a little tall to fit under some cabinets. Options Abound - While the amount of functionality available on the Precision Brewer is truly incredible, it's definitely not a 'simple' brewer. You'll be spending some time finding your ideal settings. Wash carafe and goldtone filter after every use. Descale as needed, generally every 2 to 3 months. Wipe case clean with a soft cloth as needed.